The perfect journey is never finished; the goal is always just across the next river, round the shoulder of the next mountain. There is always one more track to follow, one more mirage to explore. Thursday, April 18, 2013: We find our intrepid (or is that pronounced “inept”?) travelers on I-40 heading east smack dab into Tornado Alley. YIKES!…..gonna have to watch the weather real close like! It is near freezing with strong winds from the west and pretty much just miserable weather. 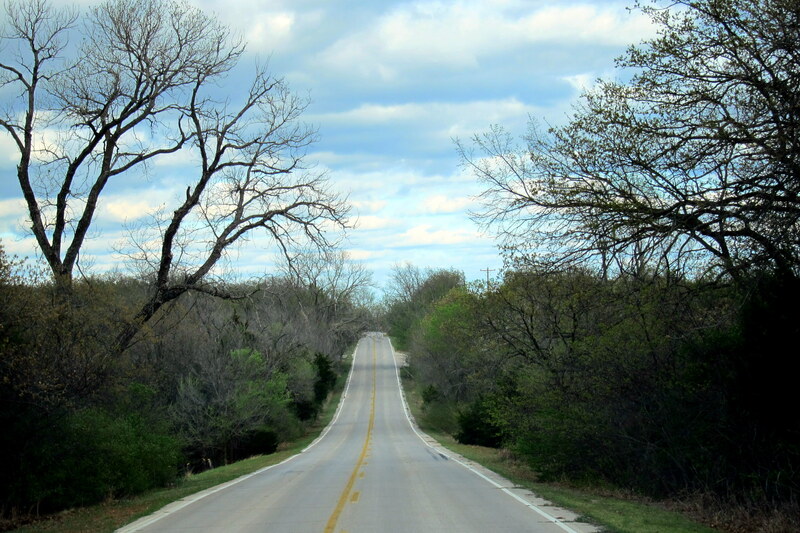 All morning we have made tracks across the Top Hat of Texas and then rolled into Oklahoma around 1330. Stopping at the Interstate visitor’s center we picked up info on the OK State Park system and visited with a nice couple from Chicago. They were motor travelers on the road for the past month with a Flat Stanley in honor of their granddaughter. Interesting to share road stories with non RV folks for a change. The terrain in this sparsely populated portion of Oklahoma was considerably different from the high plains of northern Texas. 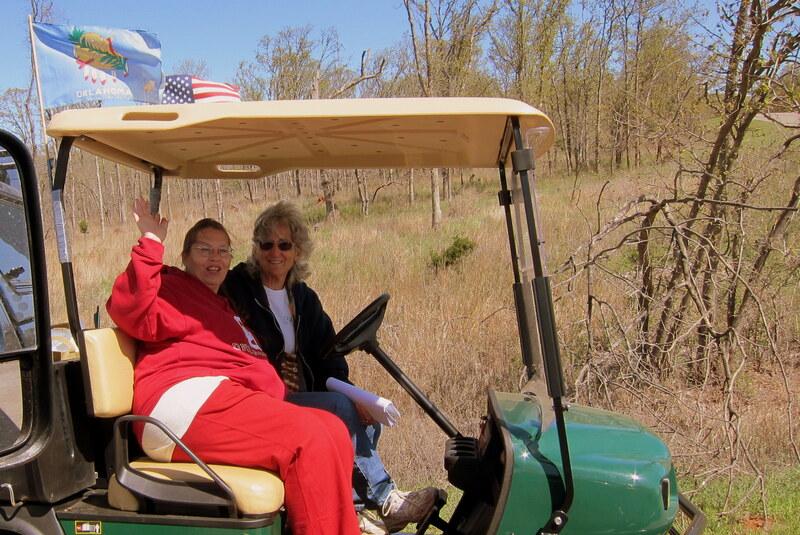 We encountered farmlands, gently rolling hills and lots of green…..even this early in spring. So, let’s see. It is tornado season…..and we are in the middle of the most historically active tornado area in the nation…..so let’s spend the night in Norman, Oklahoma, the home of the Severe Weather Center! Oh, and to add punctuation to our decision…..there were warning sirens on tall poles every mile or so. 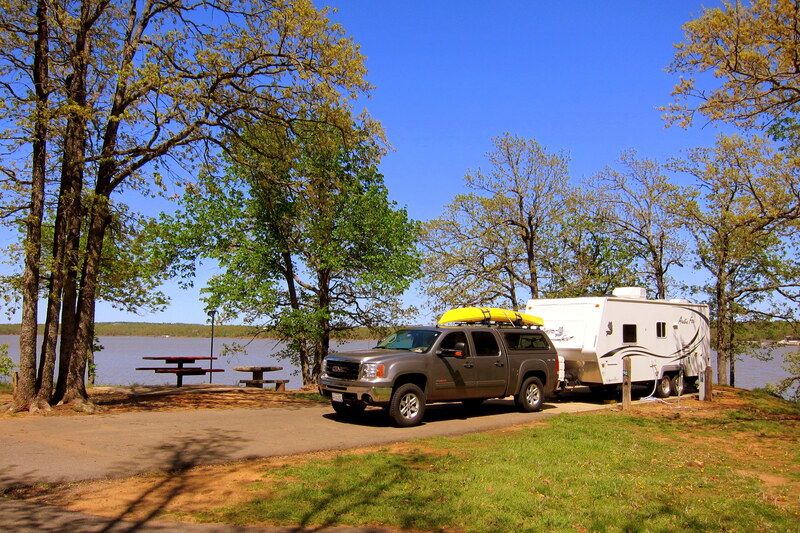 So we pulled into a nice little state park on Lake Thunderbird where we scored a primo campsite! 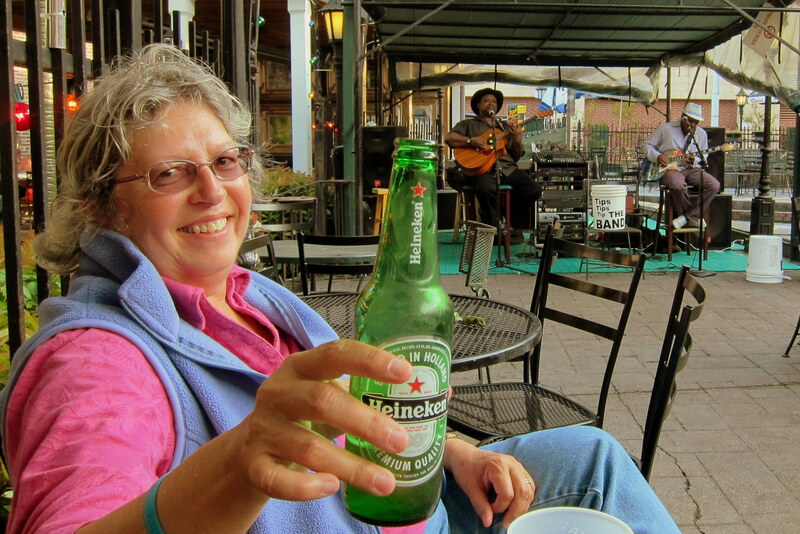 And after dinner we retired to the lakefront patio to enjoy the sun setting on another day of life on the road. 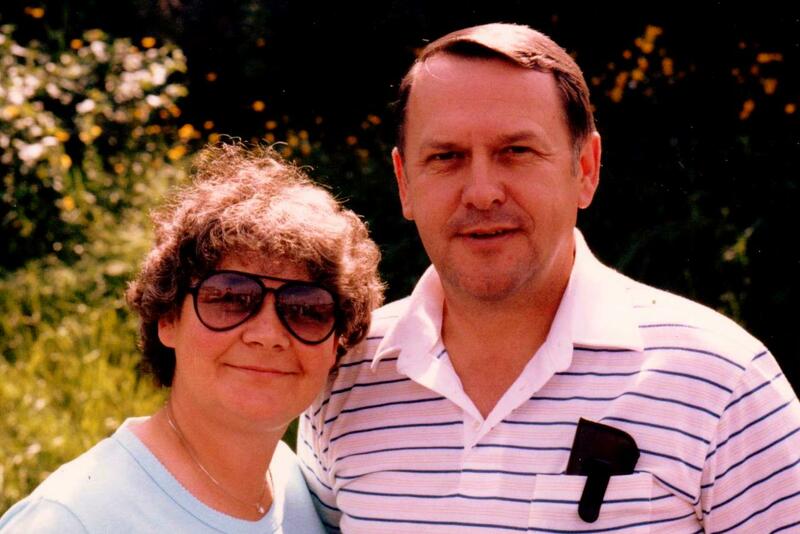 Friday, April 19, 2013-Happy 50th Anniversary to our dear friends David and Betty! In honor of their anniversary we enjoyed a leisurely morning breakfast before pulling stakes and moving out around 1100. After an hour or so of back roads we jumped onto I-40 once again to make better time as we rolled along toward the east. I find Oklahoma history very interesting. Before it was a state, most of the region was designated by the government as Indian Territories. To the authorities it appeared the areas mix of the dry arid west and the warm humid east was unsuitable for Anglo settlement. The Indian Resettlement Act of 1830 allowed the military to forcibly relocate all Indian Tribes that refused the “offer” of new lands in “The Territories” in exchange for their ancestral native lands. This forced migration became known as The Trail of Tears. “Boots”, our camp host who is from the Choctaw Tribe, was understandably proud of her heritage and told some of the native stories passed to her. The state of Oklahoma has endured much over the years starting with the relocation of the five Indian nations, the civil war, land grabs by Anglo settlers known as Sooners, many regional conflicts, the great depression, and the Dust Bowl tragedy. However the once thought worthless land turned out to contain great soil for farming and underneath lay large oil and gas deposits. 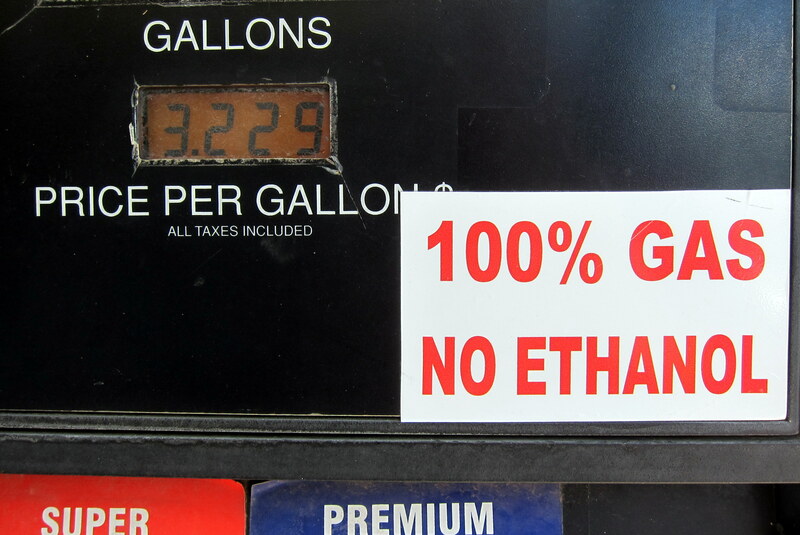 In addition since its Tribal Lands, the Native Americans have certain freedoms such as fishing and hunting without a license, ability to make a lot of money from the casinos that are patronized primarily by non-native folks, and the freedom of ignoring ridiculous laws like the federal Ethanol additive requirement. On the road again we motored down a variety of back roads that were more or less heading to the east. Very few towns or villages were encountered so we had to stop frequently for fuel in order to ensure we didn’t run out of gas. 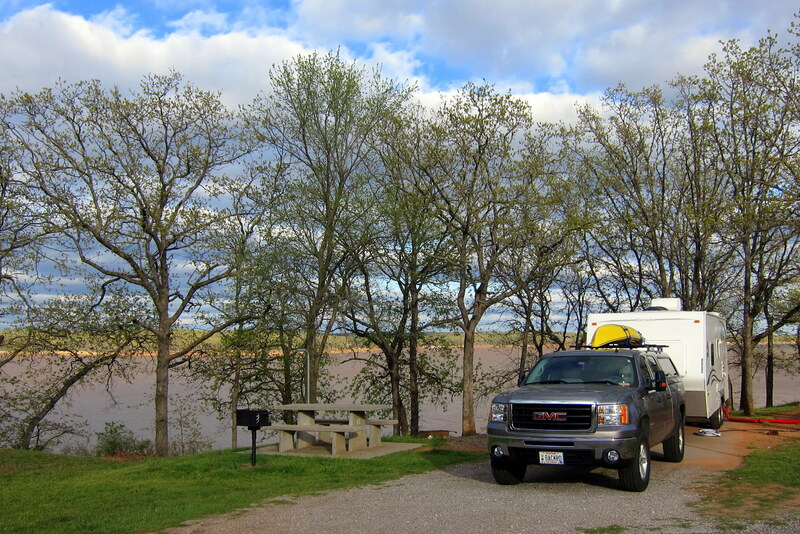 Around 1500, we pulled into a nice Oklahoma State Park on Lake Eufaula. After checking in at the ranger’s station we made our way through the vast park as we searched for a suitable campsite. 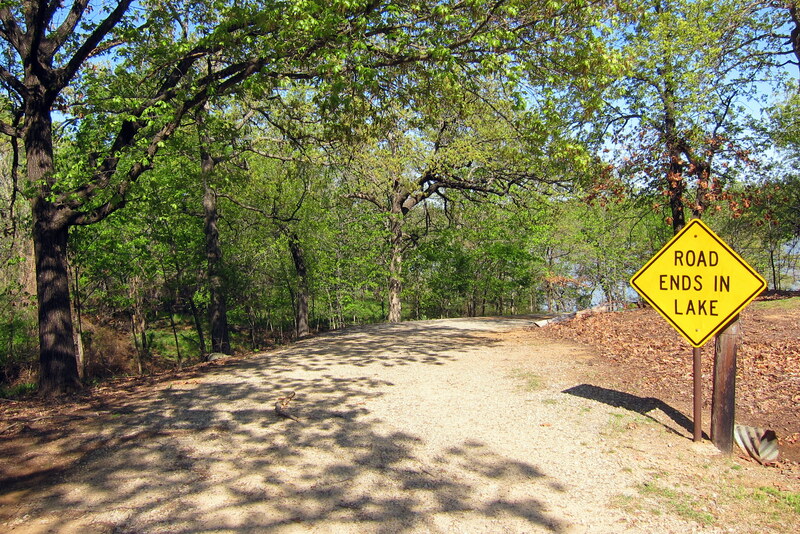 Soon we came to a road that veered off toward the lake which was posted with a rather ominous caution sign. Now that’s one traffic sign you don’t want to ignore! Eventually we found the campground and set up on a primo site overlooking the lake. One nice thing about traveling the country in the “off season” is the ability to choose the best campsites from the many available. 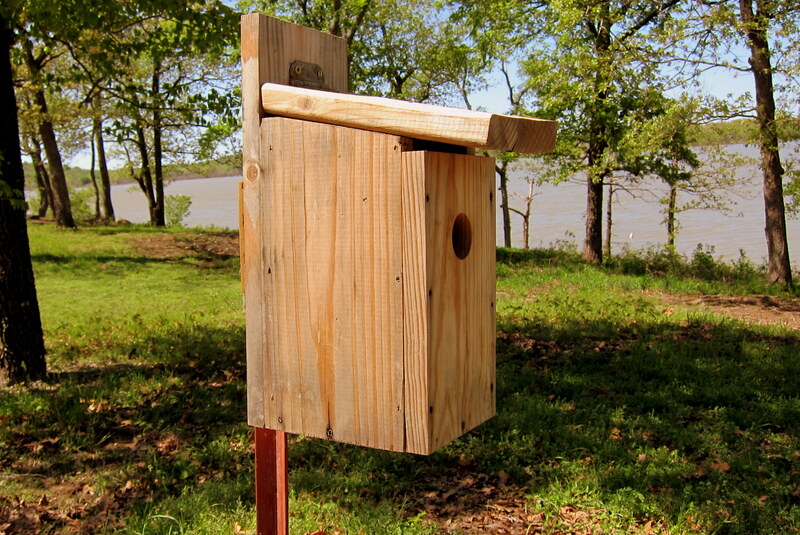 We took a walk about the grounds which featured a number of bird nesting boxes. 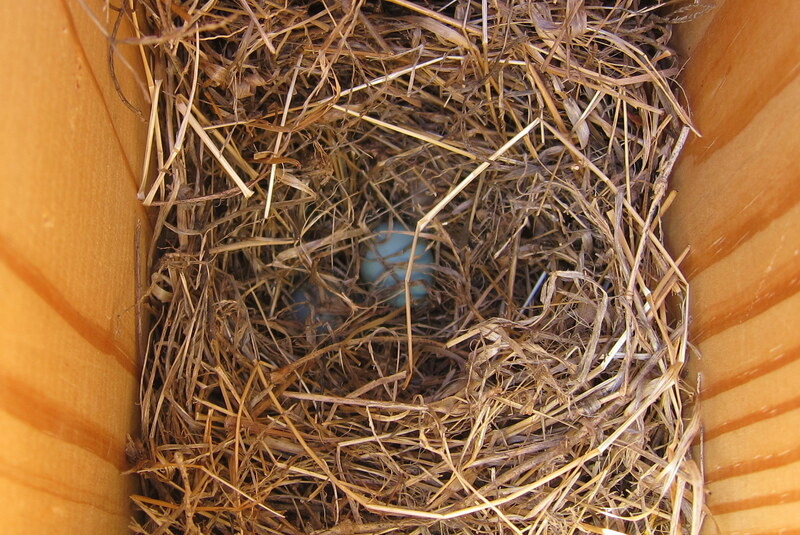 Where we noticed that many contained newly deposited Robins eggs. During our walk we met a very nice retired couple from Pennsylvania and spent the better part of an hour visiting and sharing stories of our individual RV adventures. Pete and Dee travel in a motorhome and may make a trip to New England this summer so of course we invited them to drop in for a visit. Back at the campsite, we relaxed with an evening cocktail as we enjoyed the sights and sounds of this beautiful area. Saturday, April 20, 2013: Woke to a sunny, cool morning with a slight breeze. 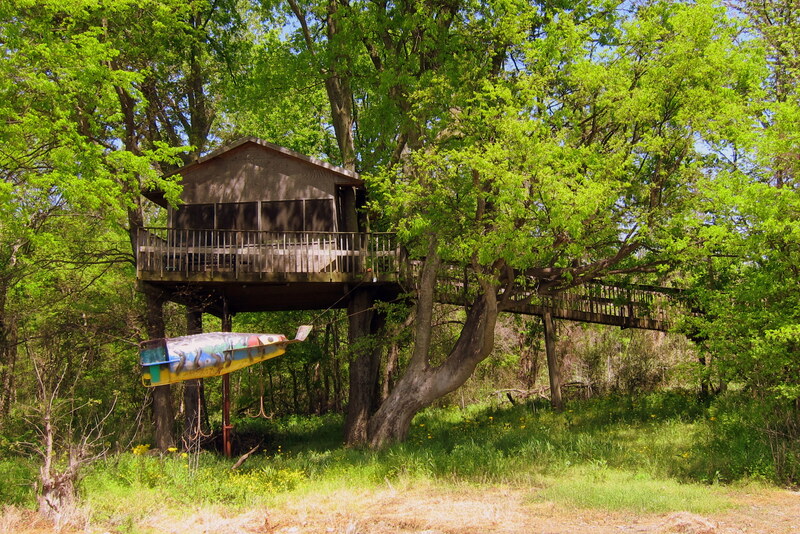 Took a walk about Lake Eufaula State Park and discovered a rather unique fishing spot. 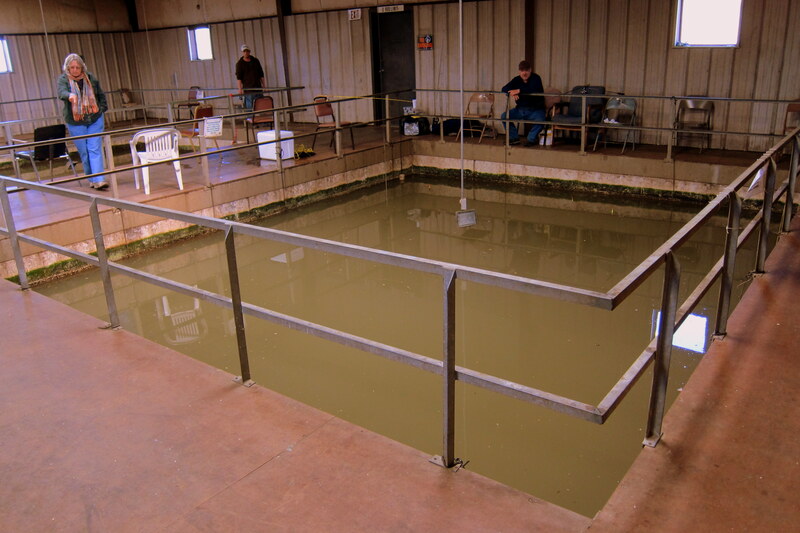 It is an indoor, climate controlled fishing barge featuring four large openings to the water. The folks we spoke to were catching a “mess O crappie” and their overflowing buckets verified that fact. There were lights suspended inches above the water to both attract the fish to the opening and allow the fisherman to see deep into the murky water. Seemed like fishing in a giant aquarium to me…..but hey, each his own. On the road at 0930 continuing east on various back roads until we decided to move up to I-40. Two hours later we rolled into Arkansas and since we were near Hot Springs National Park we decided to get off the interstate, hop on US-270 and head in that direction. 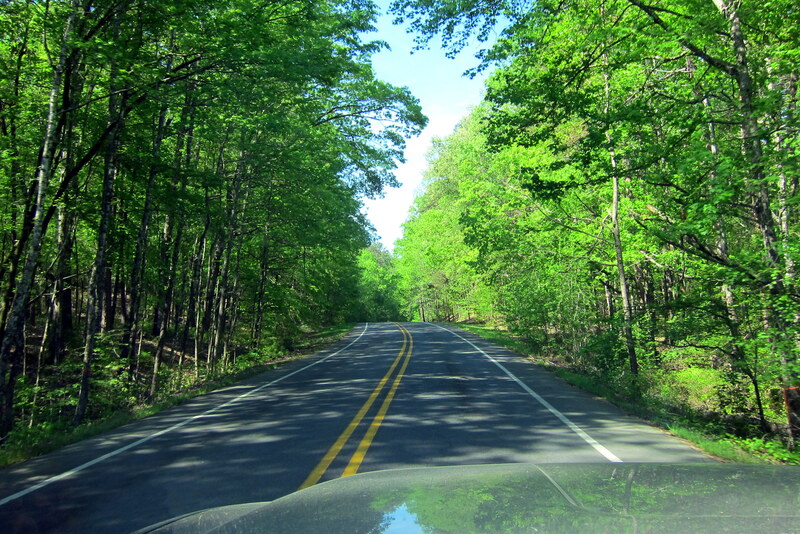 The Arkansas highways are very scenic and the hilly terrain reminded us of parts of northern New England. As it turns out, Hot Springs National Park is actually in the middle of a quaint but rather congested city. To make matters worse it was Saturday…..there were car and motorcycle clubs that had flooded into the narrow streets, a number of school proms seemed to be taking place, and the streets were narrow and difficult to maneuver a trailer through. At one point we ended up on a road with only one way out and that was up a steep, windy path that led to a mountaintop observation tower. So up we went, taking both lanes to maneuver safely around the hairpin turns and getting startled looks from the more sane motorists that arrived by automobile. So what is the story behind this unusual National Park? Well, back in the early 1800 word started circulating that the natural thermal springs in the area contained therapeutic minerals that “cured” any and all afflictions. Pilgrims flooded the little valley and speculators started buying up land and charging for access to the spring water. The government, worried that this magic source of healing would soon be restricted to the wealthy designated the entire valley as a National Reservation, the first such action in the history of the young country. Shortly after, the War Department commissioned the building of a military hospital on the grounds so sick and injured soldiers could reap the curative benefits of the warm waters and therapeutic vapors. Today, it is basically a tourist attraction replete with numerous gift shops, bath houses, hotels and restaurants. Might be fun to explore…..someday. 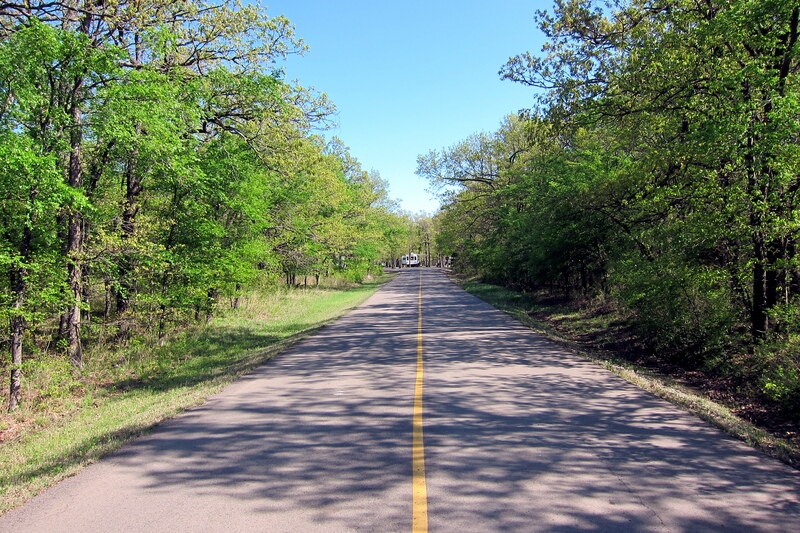 Getting late and somewhat frustrated, we meandered through the countryside toward Lake Catherine State Park. Pulling in we were confronted by a large sign the read “Campground Full”…..Arrrrrg! To make matters worse, the office was closed and it was beginning to get dark. Just as we decided to stay right there in the parking lot I spotted a park ranger drive by and flagged him down. Taking pity on our plight, he led us to a very nice part of the park that wasn’t technically a camp spot and allowed us to hook up to a nearby power source. Road magic comes to our rescue once again! Sunday, April 21, 2013: Up and after a walk about the campground we resumed out travels under sunny skies with temperature in the lower 60’s. Lake Catherine State Park turned out to be a very nice campground and one that if we find ourselves in the area again we will strongly consider. 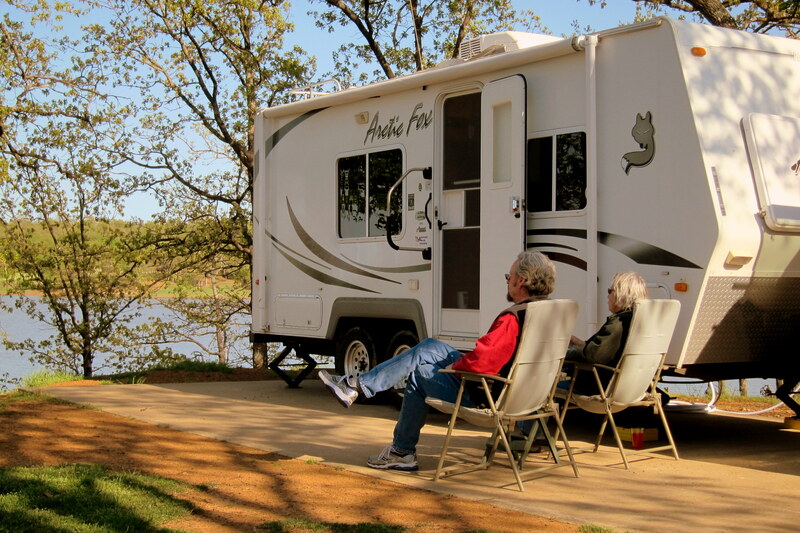 We did decide that it would be nice to explore Hot Springs National Park some day, urban as it is……however we will choose a weekday and leave the trailer at a campground! We wound our way through some beautiful countryside and quaint towns. 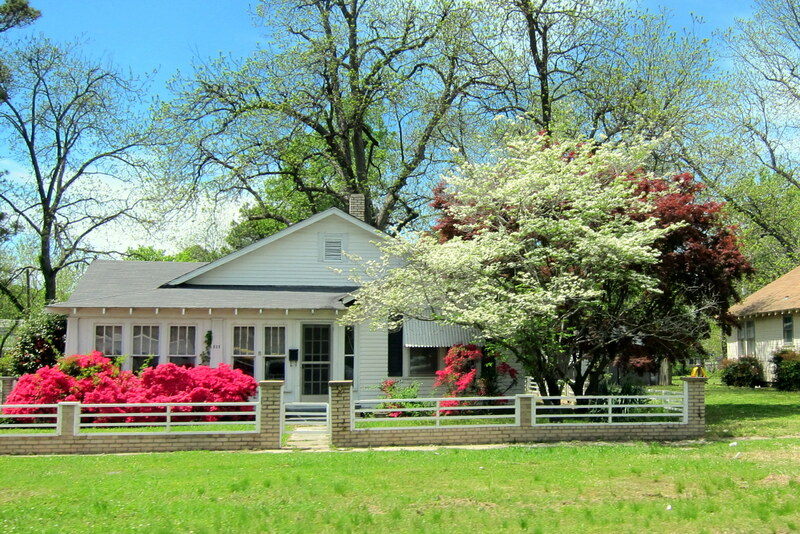 Spring has definitely arrived…..every tree is leafing out and every flowering bush is in bloom! The eastern part of Arkansas is a major rice producing area. In fact 45% of the US supply of rice comes from this relatively small area. 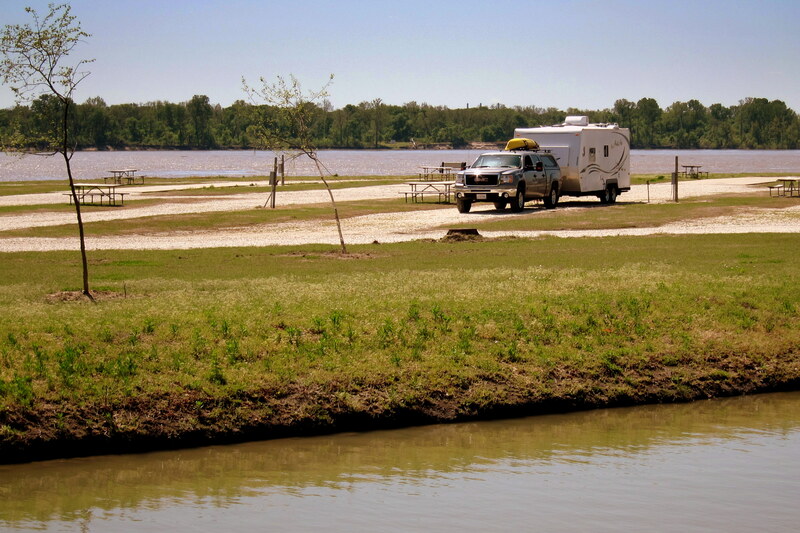 Around 1500 we decided to call it a day and pulled into West Memphis, Arkansas and headed for a uniquely named campground “Tom Sawyer RV Park”…..which no surprise, is located on the banks of the Mississippi River. River flood advisory in effect until 2 pm CDT Wednesday. The flood advisory is extended for the Mississippi river at Memphis until Wednesday may 01. At 10 am Sunday the stage was 23.9 feet. Flood stage is 34.0 feet. Forecast the river will rise to near 32.5 feet by Wednesday may 01. Settlement at blue lake is flooded. Most all secondary roads east of the Arkansas levee are covered. Since we were planning to pull out in the morning we felt safe staying overnight but did keep a wary eye on the rising water levels. This park has been inundated during past spring floods. The office building is on wheels and the stationary buildings are on stilts, such as the clubhouse nestled in the woods (pun intended). Yep, that’s a giant fishing lure suspended from the trees! The brand new and free laundry was also located above grade in this building. 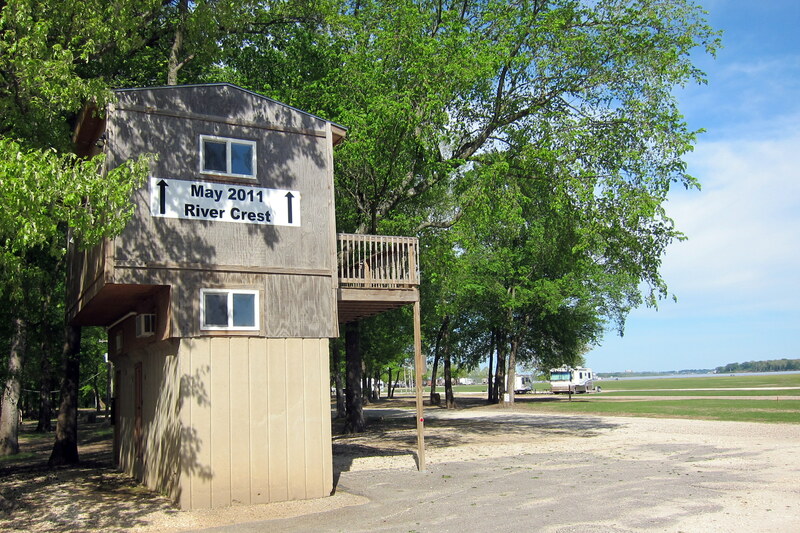 Notice the high water mark from two years ago and then notice the RV in the background…..Yikes! 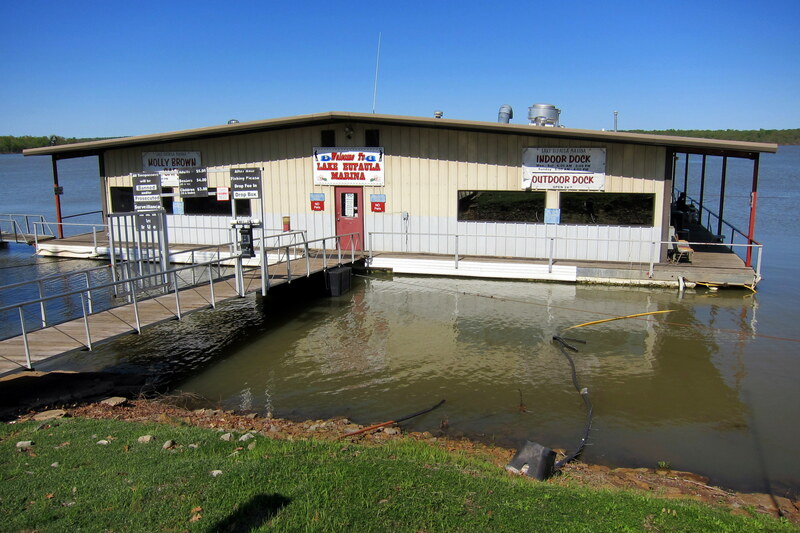 The owner did assure us that we were perfectly safe and that all previous floods had occurred very slowly…..unless a levee upstream broke, then all bets were off. Since he lived in an RV nearby I figured if he sped up and over the levee…..I was gonna be in hot pursuit. We spent the remainder of the day enjoying the river traffic roll by. 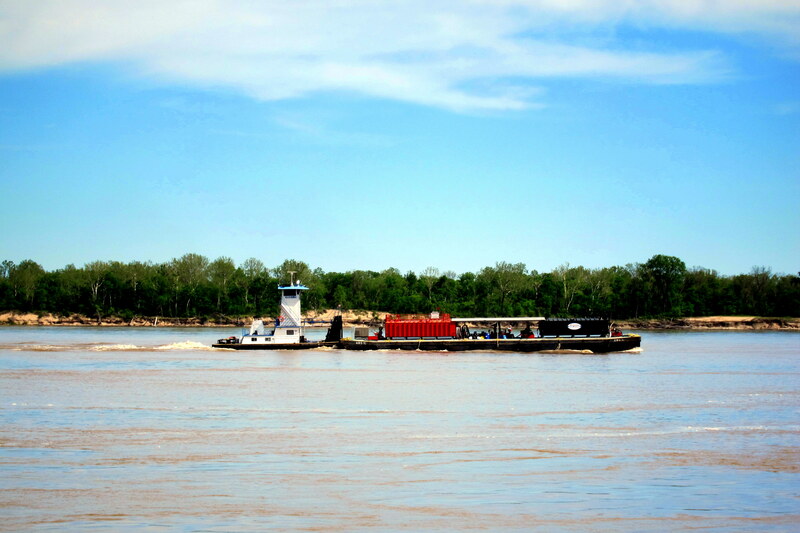 There were small barges that with the increased river current were moving by quickly. 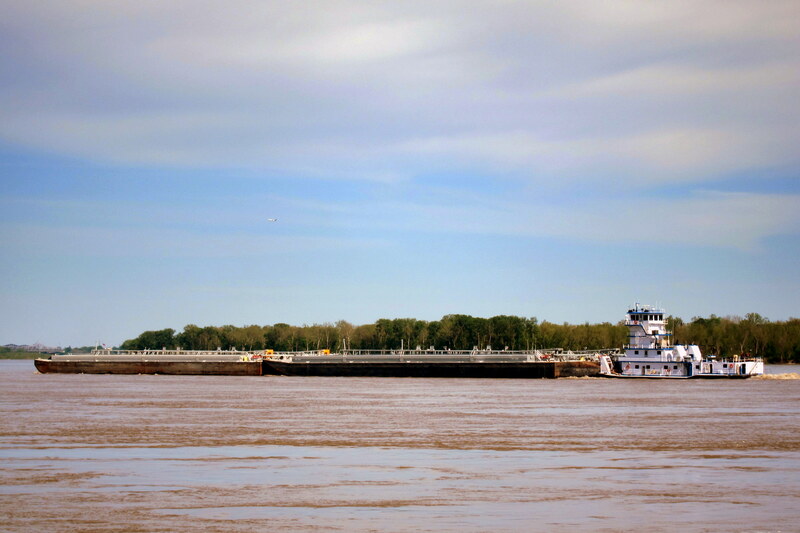 There were large barges laboring upriver and barely moving under full power. Most barges appeared to be hauling grain of some sort. However there was a few that contained large long tanks, likely for petroleum products. 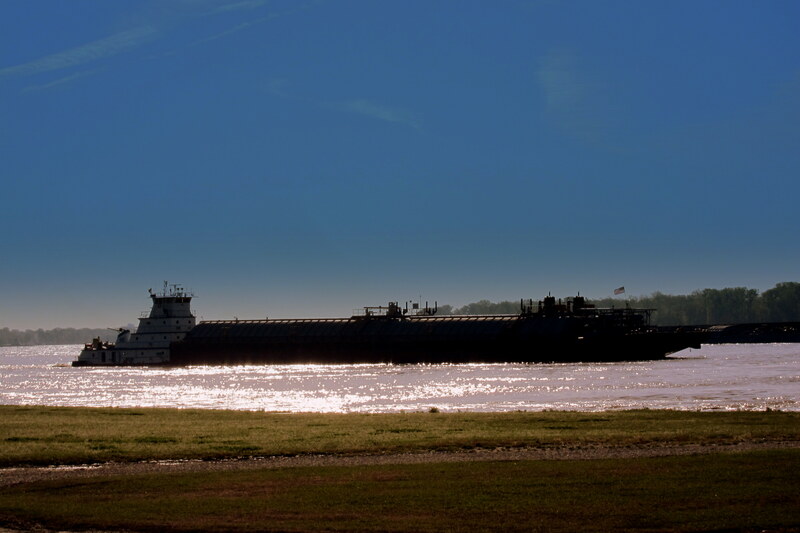 I never get tired of watching commercial shipping moving by and wonder how it would be to captain such a large, ungainly vessel in the shifting currents of the Mississippi. Since there was plenty of room at the campground and since the winds were strong and consistent, I also spent some enjoyable hours flying a few different kites. Think I might have the “side slide” figured out there Dewey…..however I’m only successful about half the time. Great time in a very nice park…..hope it escapes the high water on Wednesday! 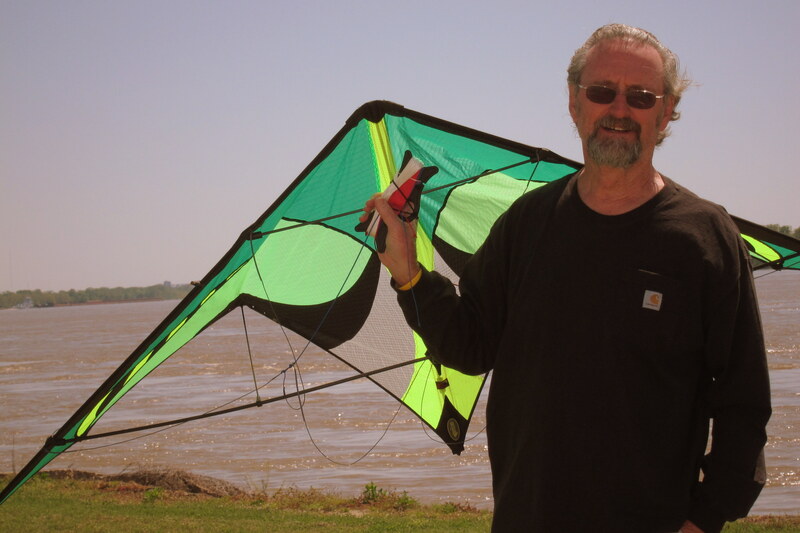 Monday, April 22, 2013: Enjoyed a leisurely morning breakfast and lounged around until the checkout time of noon……more kite flying was to be done! This is to be a very short travel day across the river to Memphis, Tennessee. 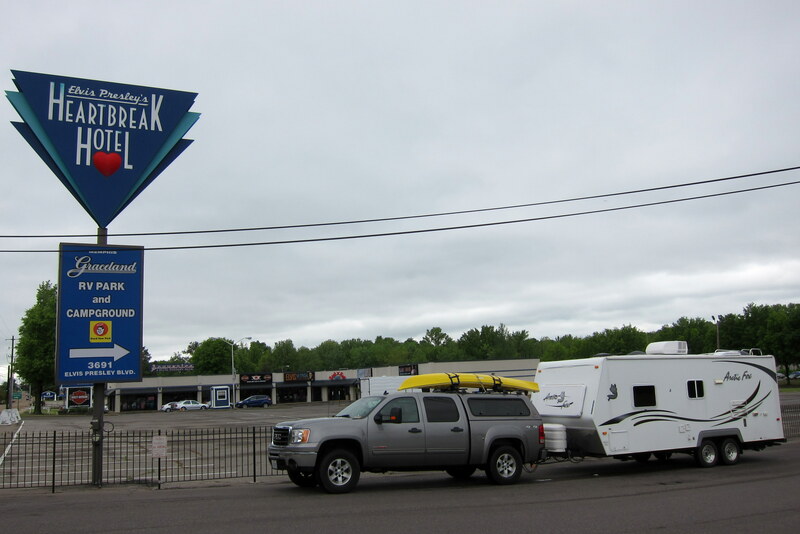 We found I-55, crossed the Mississippi, and arrived at Graceland RV Resort within thirty minutes. This place has been on Kit’s “Bucket List” for a while now and her wish is about to be fulfilled! The park was a bit crowded with narrowly spaced sites stacked up four roads…..we were on “Don’t be Cruel Lane”. 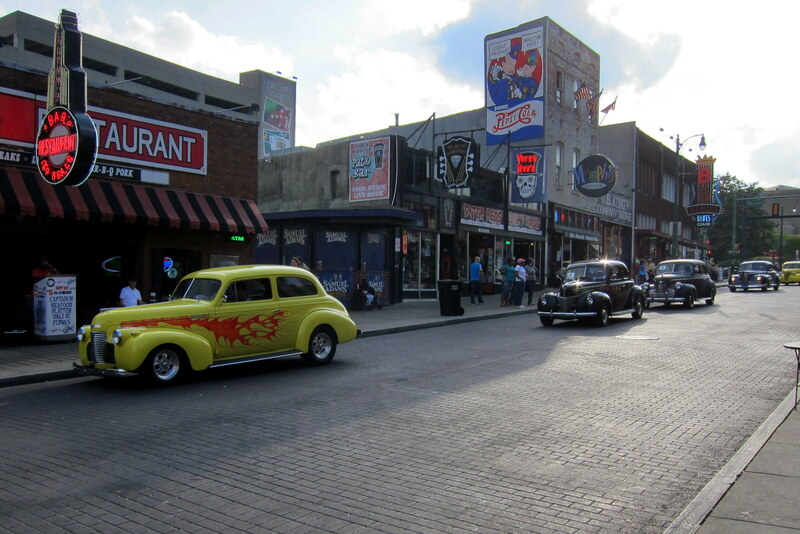 However it was within walking distance of Graceland and right behind Heartbreak Hotel……hollowed grounds for the Elvis faithful. 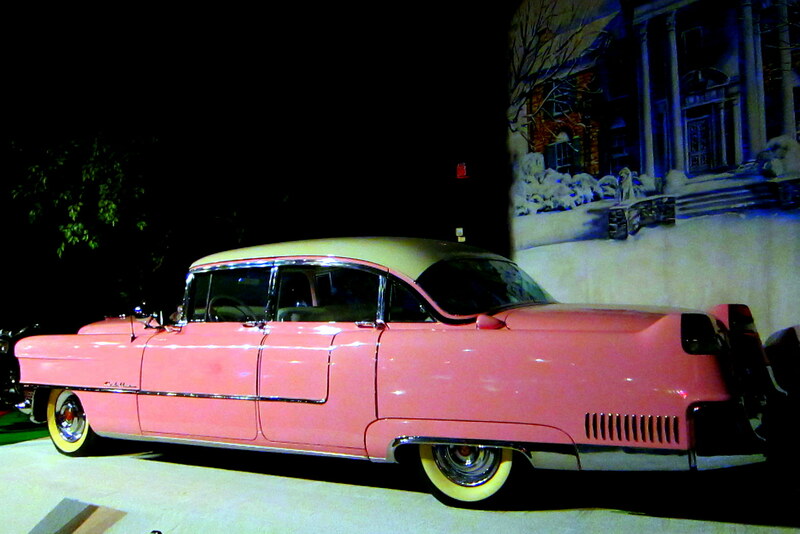 This place is a virtually Disneyland for folks lost in the 50’s! Since it was early in the day, we quickly connected to the full hook up site and made our way to the main attraction. Kit decided that the Premium Package was the best so we purchased tickets for an afternoon tour of 6 sites, some guided and others not. Since it was a while until the tour started we decided to grab lunch at the Rockabilly’s Diner. Kit was in her glory, surrounded by Elvis photos, music and memorabilia. 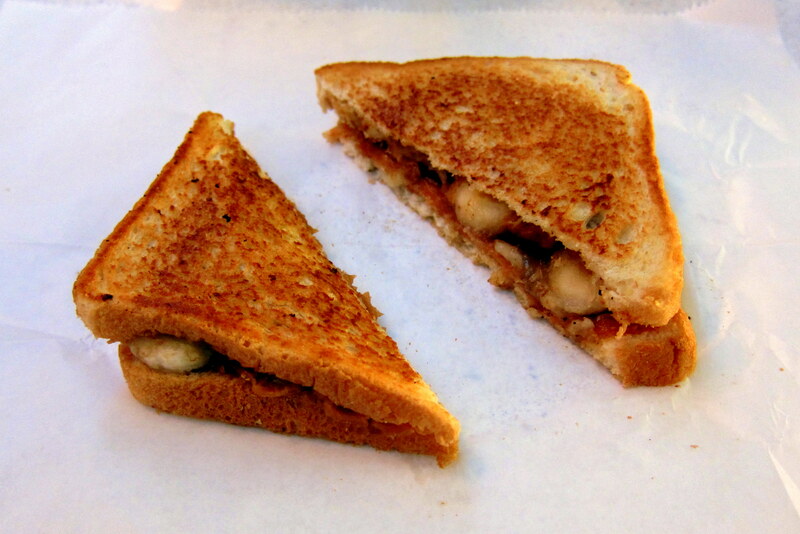 Being a bit more gastronomically adventurous, I went for the Elvis special…..peanut butter and banana dipped in lard and grilled to a golden perfection. Kit enjoyed a hamburger and fries. 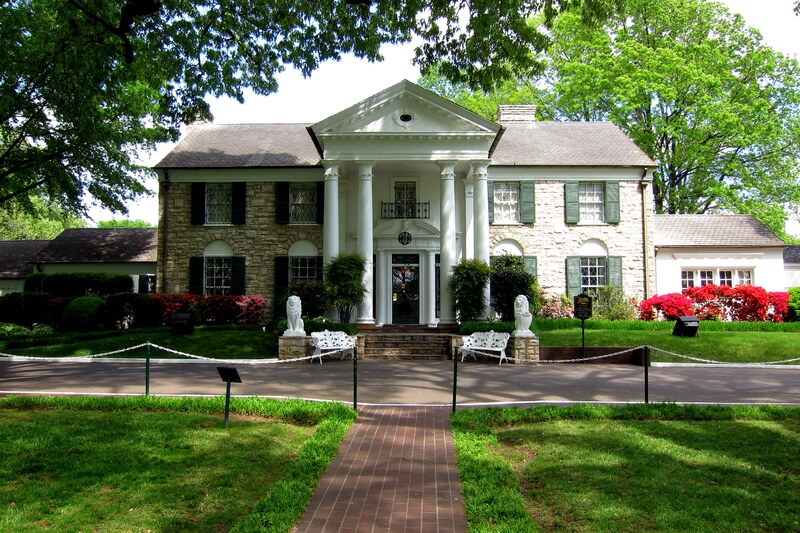 Graceland is the third most visited home in America with more than 700,000 US and foreign fans making pilgrimages to the site annually. 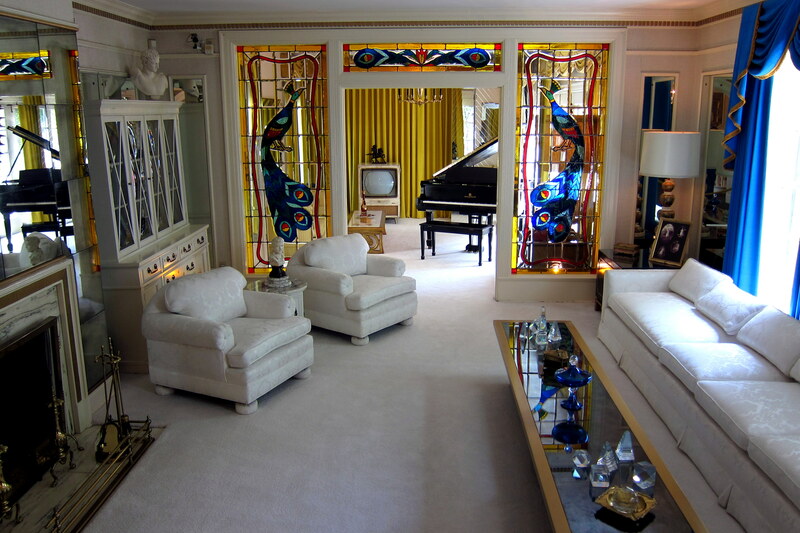 It is a relatively modest mansion that Elvis purchased when only 22 years old. The name was inherited from the former owner Grace Toof. Elvis liked the Gospel connotations of the name and decided to keep it. 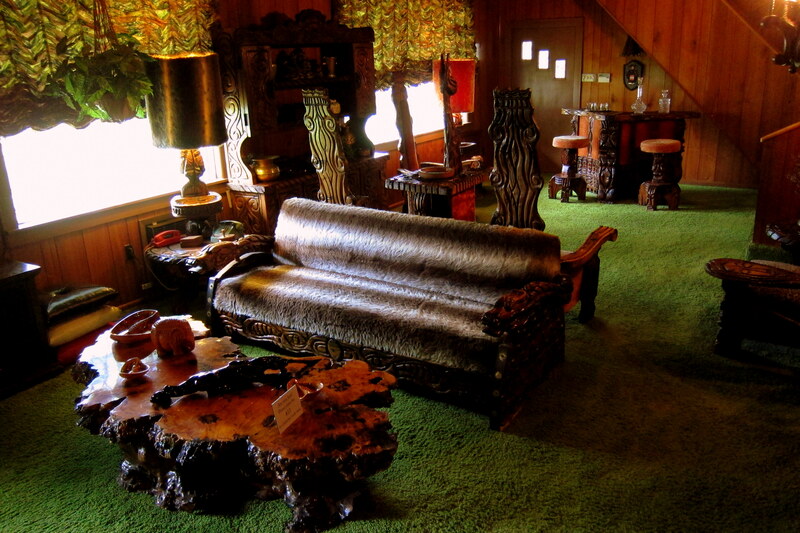 The home tour winds through an elaborately decorated living room where many anecdotal stories of The King are told. Also featured on the tour are some of the many guest bedrooms, the kitchen, his recording studio, the media room featuring three side by side television sets and the famous Jungle Room with its indoor waterfall and tribal decorations. 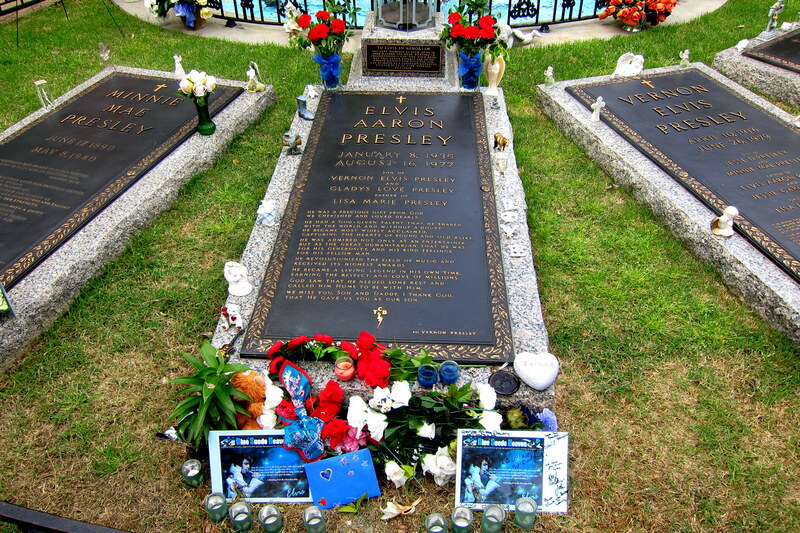 Elvis died in the home and the place of death, known as the Throne Room, is not open to the public. However he is laying in eternal repose out in The Meditation Garden and that is featured on the tour. Lots of flowers and personal shrines are left at The Kings grave, many by the adoring foreign tourists that trek here from all over the world. The offerings are picked up throughout the day, cataloged and donated to charity when appropriate. We also toured Elvis’s trophy room where are all the Grammies, gold records and stage costumes that he owned are on display. 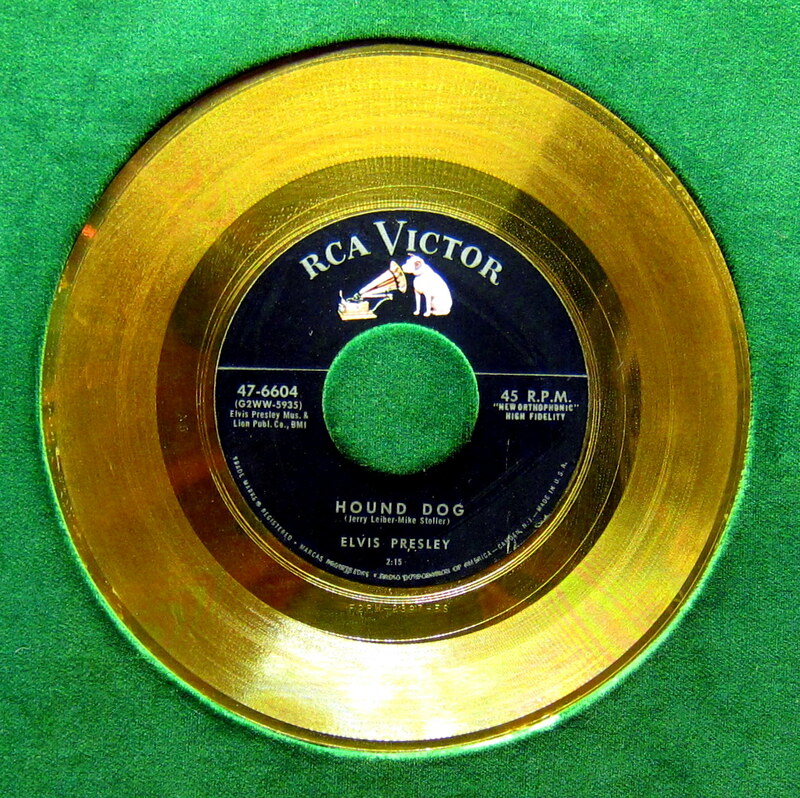 A personally interesting artifact was his gold record for the single “Hound Dog”, which was the first Rock and Roll record I remember hearing on the old Philco Superheterodyne back in 1956 when only 9 years old. Also on the property are the two jet aircraft and many fancy automobiles that Elvis owned, including his famous pink Cadillac. While touring Graceland, we learned something about Elvis that received very little press. Back in 1961, he performed a benefit concert in Hawaii for the USS Arizona Memorial building fund. The history is that in mid-1950’s as the stricken vessel sat in the mud of Pearl Harbor with over a thousand brave souls still onboard there was some disagreement on what to do with the ship. President Eisenhower eventually decreed that the Arizona would remain as is and that a fitting memorial was to be built using a mix of public and private funds…..however contributions were slow to materialize. Elvis, having just been released from his tour of duty in the Army wanted to assist the fundraising effort. His concert raised over $60,000 dollars, which would be close to a half million today, all of which went to the Arizona Memorial fund. More importantly the concert raised worldwide awareness of the memorial and many associated donations followed as a direct result of Elvis’s involvement. 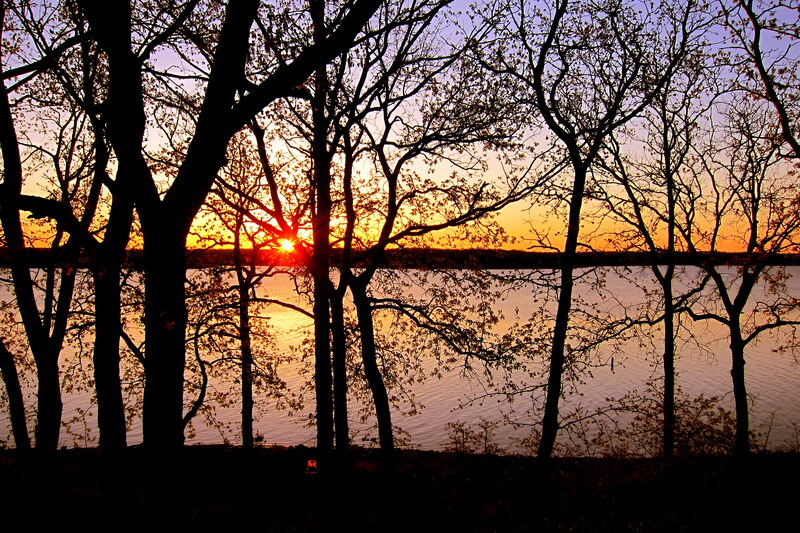 Tuesday, April 23, 2013-Memphis, Tennessee: Woke to another sunny day with mild temperatures predicted. We decided to unhook the truck from the trailer and drive into downtown to enjoy some of the sights in this legendary city. The first stop, which was recommended by our daughter Suzie, was the Peabody Hotel. The old posh hotel was constructed in 1925 but became internationally famous due to a prank by the general manager back in the 1930’s. He and a hunting companion returned from a duck hunt a bit liquored up with their live Call Duck decoys. 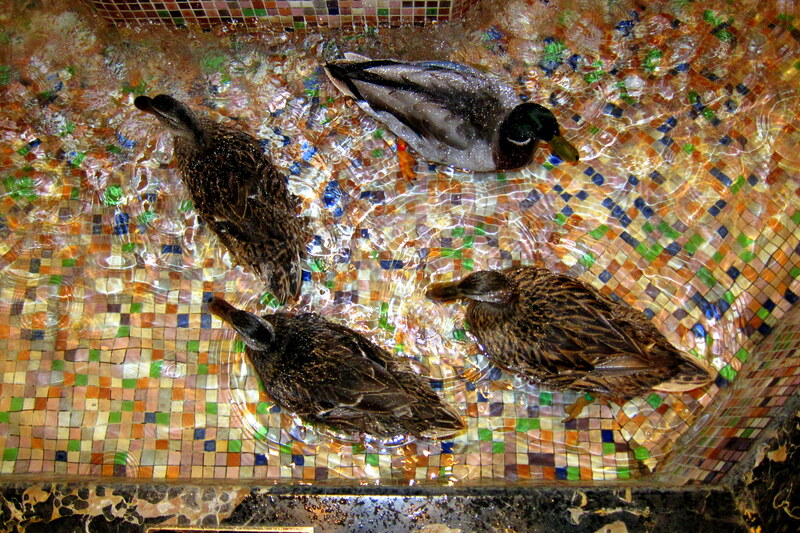 They thought it would be humorous to place the animals in the ornate fountain that graced the lobby. The hotel patrons thought it was wonderful and a tradition was born. 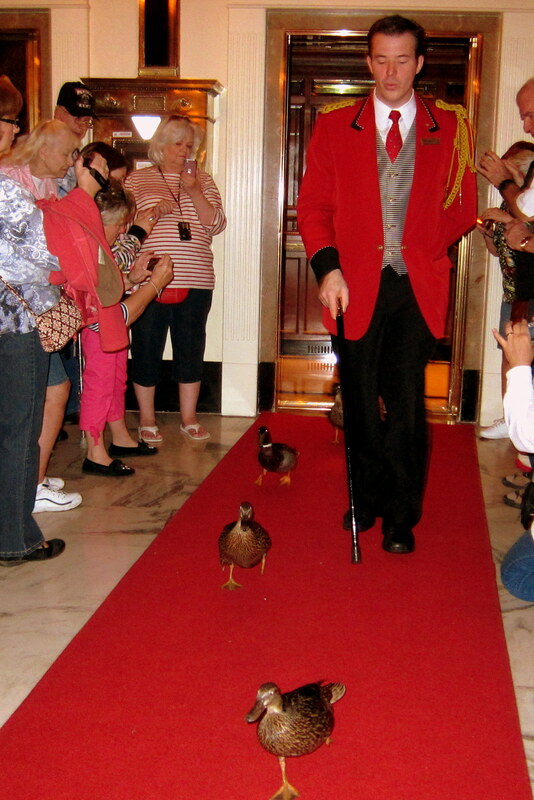 Every morning the resident Duckmaster in full royal attire, shepherds the ducks from their rooftop quarters, into an elevator and down to the lobby. Then across a red carpet, up a few steps and into the fountain while the strains of a Sousa march plays in the background. 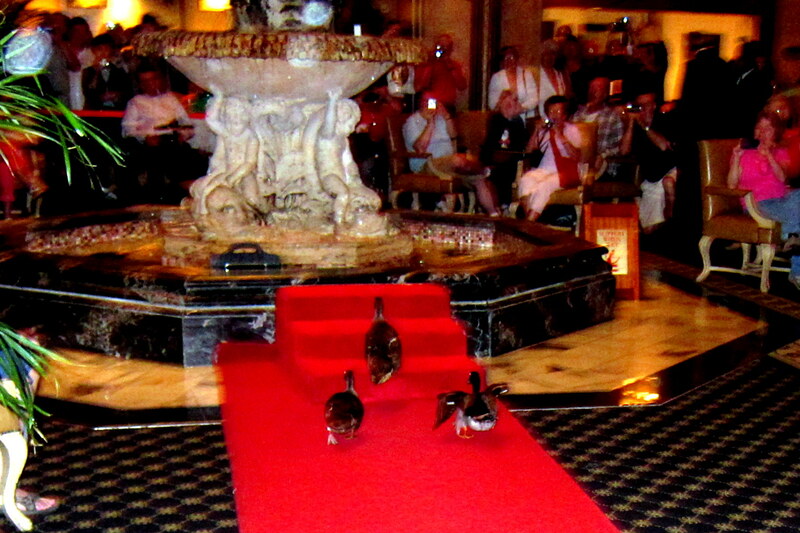 The Peabody Ducks happily paddle about while being fed and fawned over by their adoring fans. 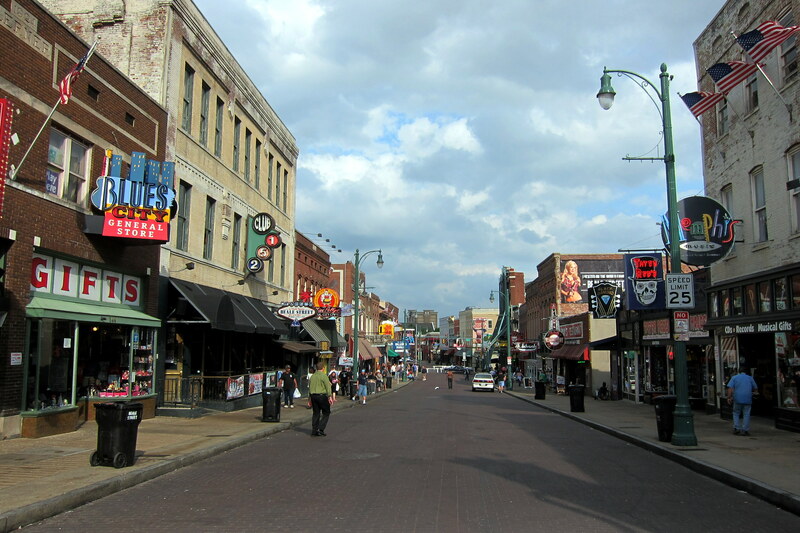 Our next stop was the world famous Beale Street just a few blocks away. 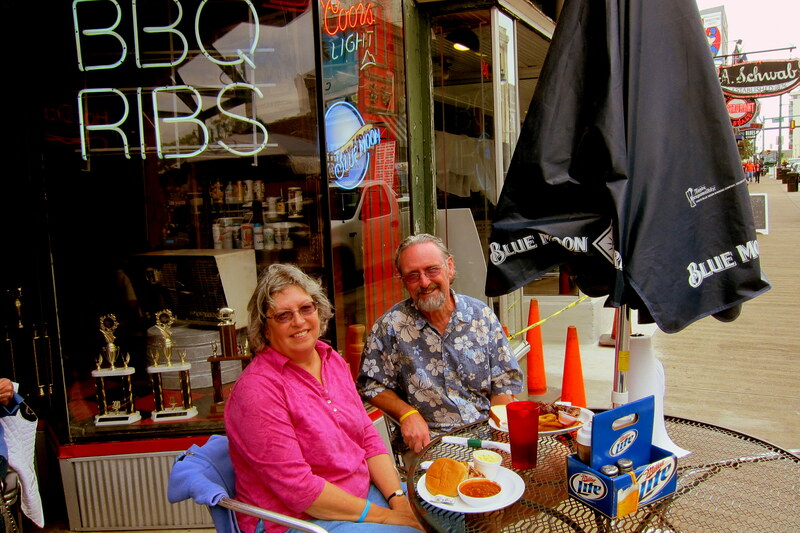 Since it was now past noon, we decided to enjoy some authentic Memphis Barbeque by dining al fresco at the famous “Pig on Beale”. We enjoyed a great meal while watching the street performers, locals and tourists stroll by. 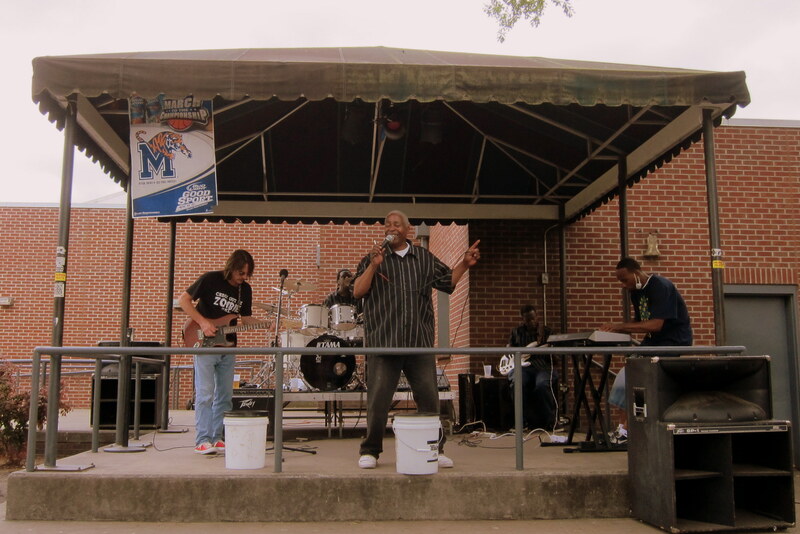 After lunch we wandered the length of Beale Street and listened to a few talented musicians playing the blues, Memphis style. Later, much to my very pleasant surprise, a number of custom cars and street rods started lining up on the street for a weekly rally. While Kit shopped I spent the rest of the afternoon looking at the 50 some odd collector cars in attendance. Meeting back up, we walked about for a while longer and as we were deciding what to do next, two young women approached us and offered a free book. Apparently today was National World Book Night. 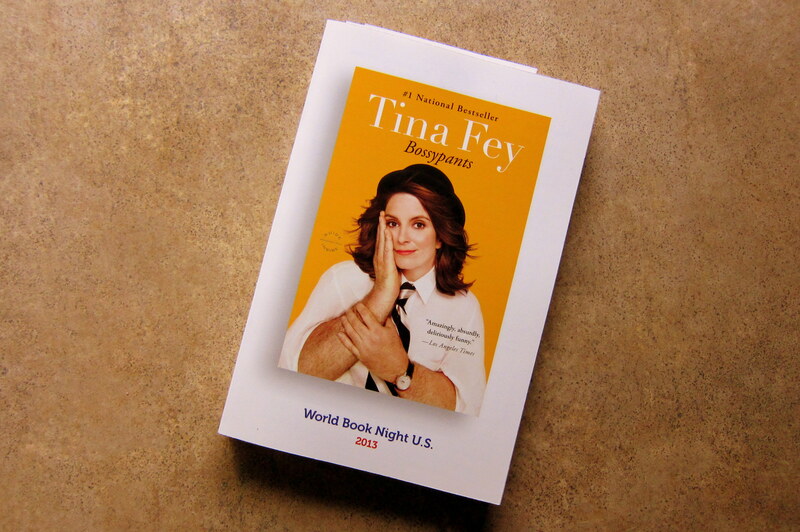 Anxious to read this book as we are both Tina Fey fans! Still full from lunch, but not ready to return to the campground, we enjoyed some more Memphis Blues while downing a few Barley-pop’s. A great stay in this historic southern city, but tomorrow we must continue easterly…..stay tuned, as this year’s Excellent Adventure is drawing to a close. 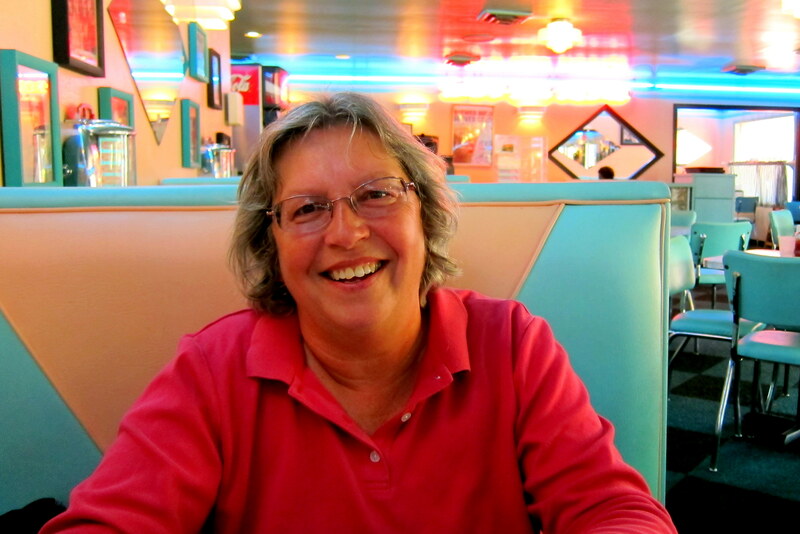 Kit’s Corner: As we continue eastward toward home, I have mixed emotions. On the one hand, I’m anxious to get home, see family and friends and on the other hand, I’m really enjoying all the crazy things we do while on the road and hate for it to end. Never in a million years would I have expected to be watching ducks come out of an elevator in a super fancy hotel! 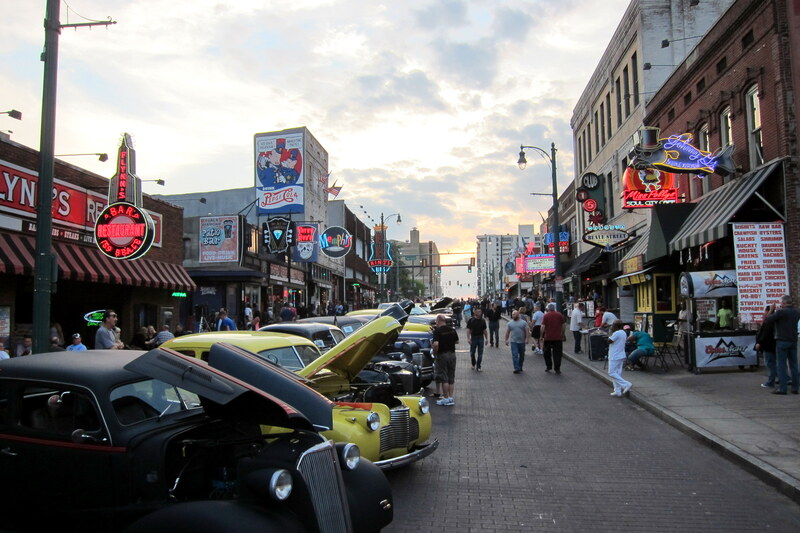 Nor, did I ever expect to be touring the authentic Beale Street in Memphis! Also, I’m SO GLAD Bill is writing all this down so I can refresh my memory in my “old age” while I’m in my rocker. 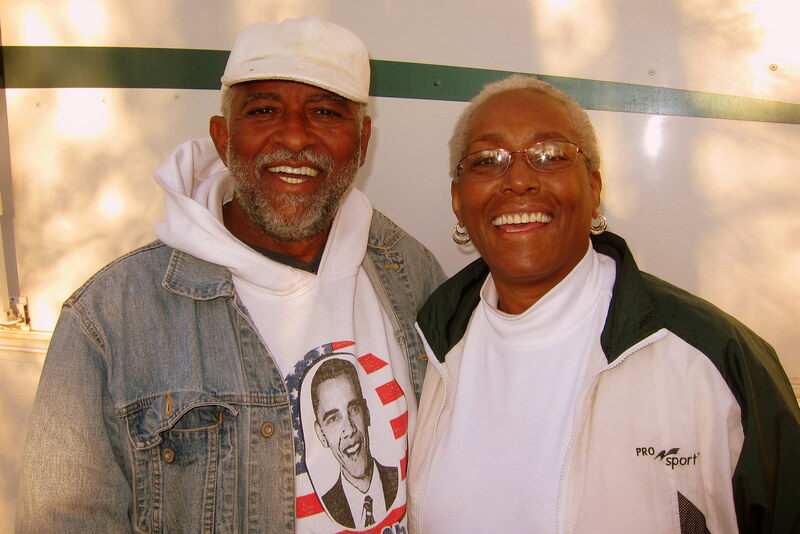 J Stay tuned…..
Love the tribute to Betty & David’s 50th anniversary. Great way to celebrate by not leaving until 1100. Glad you are booth back home safe. Thanks, great to be home. Hope to see you folks soon! I GIVE UP, WHAT’S A FLAT STANLEY?? GREAT WEATHER HERE, JUST HAD RAIN AFTER TWO WEEKS OF SUN. FOREST FIRES WERE A REAL CONCERN. SUNDECK IS IN PLACE AND BOATS ABOUT READY TO LAUNCH. FUNNY ABOUT ELVIS. JEANNE LOVED HIM AND HER UNCLE SAID HE WAS JUST A FLASH IN THE PAN, JEANNE NEVER LET HIM FORGET IT. SHE HAS MANY OF HIS OLD 45RPMs. LOOKING FORWARD TO LUNCH/DINNER WHEN YOU ARRIVE HOME. That was my question as well…..apparently a Flat Stanley is a cardboard human figure with a photo of a real persons face glued on. I guess you carry it about on your travels and photograph Flat Stanley at all the places you visit. Looking forward to seeing you all as well. Wow! You guys have a knack of finding the most unusual places. That inside fishing hole was so unusual and the photos of Graceland and Elvis’s final resting place gave me goosebumps! I’m glad you got out of tornado alley safely! Great pictures and stories as always! Thanks for the comment and your nice words on our efforts to chronicle these trips. Sorry we missed Prescott Valley, however if you get to Maine this summer give us a call. Loved the pictures and stories of Graceland! Sam and I want to go there on a weekend getaway soon! Thanks for the nice words on our efforts to document the places we explore. 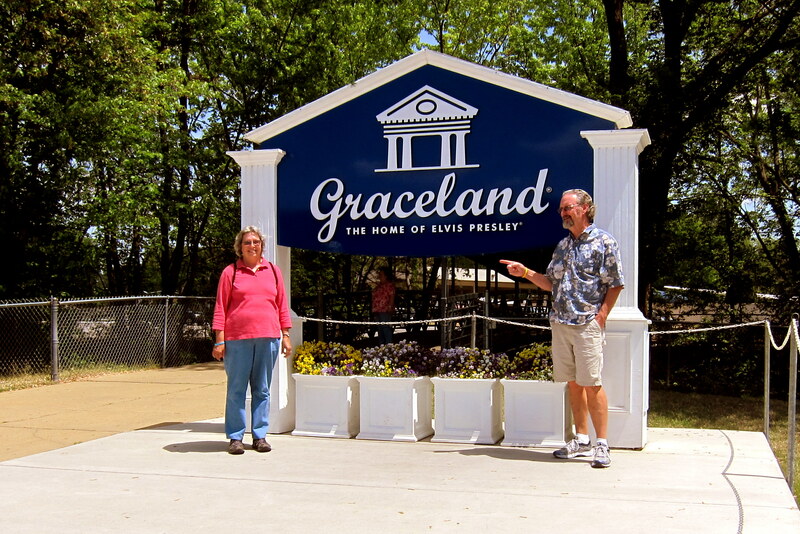 Graceland was Kit’s thing but as it turned out I enjoyed it just as much! Who would of thought?!?! 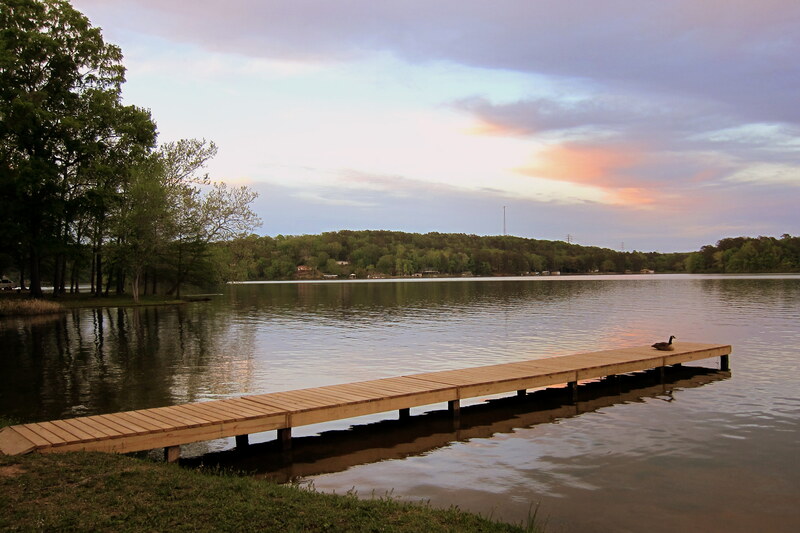 Thanks folks, looking forward to seeing you all up to the lake real soon!!! Im looking to camp at San Onofre in southern California and would like to know what campsite you stayed in during your 2011 visit (shown in your pic). I checked on line and only see bluff sites available? Your site looks like it is right on the beach. Any info is greatly appreciated. BTW-I love your blog! Look forward to hearing from you. Thanks! Good morning, thanks for the nice comment on our blog. It all started kind of simply as a way for us to chronicle and share our travels with family. However, it soon grew a bit beyond those humble beginnings and now that the various web engines have found us we get nice comments from folks we have yet to meet! All kind of humbling. Anyway, now to your question. We stayed at a military recreation beach for the US Marine Corps and unfortunately I doubt it is open to the public…..however if you have any government affiliation at all I would encourage you to try. As fellow campers, our paths may cross at some point so please keep checking back to see where we may be…..it would be nice to meet you in person.